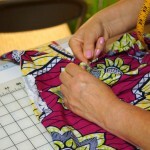 We can create custom clothing designs for you from start to finish! Just contact us with your ideas and we’ll be happy to schedule a free consultation with you. We enjoy working with each client to bring their ideas to life and create a one-of-a-kind piece. 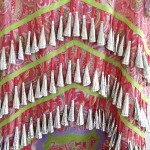 We can create a pattern just for you based on pictures of designs you like and your measurements. 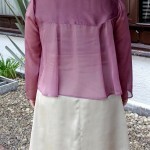 It will be tailored just for you, and made with the fabric of your choice! Can’t find a picture that is quite like what you have in mind? No problem, we’ll sketch out a rough outline of your ideas during the consultation ad work with you to create the perfect design. 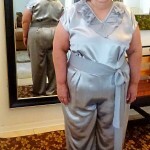 Some of the most memorable projects we’ve created include a two-piece outfit for a special maternity photo shoot, a satin jumpsuit for a mother-of-the-groom, a custom wedding gown, and various custom dresses, blouses, and more. 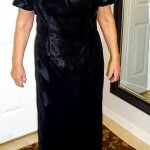 Here are a few pictures of some of the custom outfits and/or alterations we have completed! Custom maternity set we created for a special photo shoot. Another picture of the maternity photoshoot. 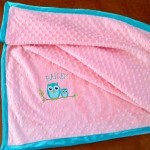 Custom baby blanket with embroidered name and owl. 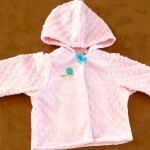 Adorable hodded cardigan to match the custom baby blanket. 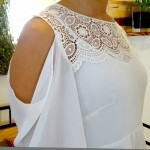 Custom chiffon shirt to be layered over various shells. 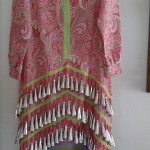 Custom dress and elegant matching jacket. 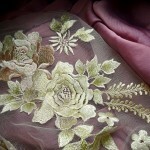 Details of custom dress/jacket fabric. 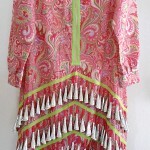 Native american performance costume alterations. Contact us today to schedule an appointment for your own custom clothing design!